1. Blend the chopped tomatoes, onions and habanero peppers. 2. Heat the vegetable oil in a sauce pan until lightly smoking, and then pour in the blended tomato mixture. 3. Add salt, knorr and spices to taste. 4. Simmer for 10 minutes, stirring regularly. 5. Once the mixture is dry and you can see the oil bubbling separately, add the sliced bell peppers and onions. 6.Stir well and then remove from heat. 1. Put a pot of water to boil, enough to cover your pack of spaghetti. 2. Add a pinch of salt and a couple of drops of oil. 3. Boil for 10 mins, or until the spaghetti is as soft as you like it. 4. Drain in an large colander and pass cold water quickly over it. 1. 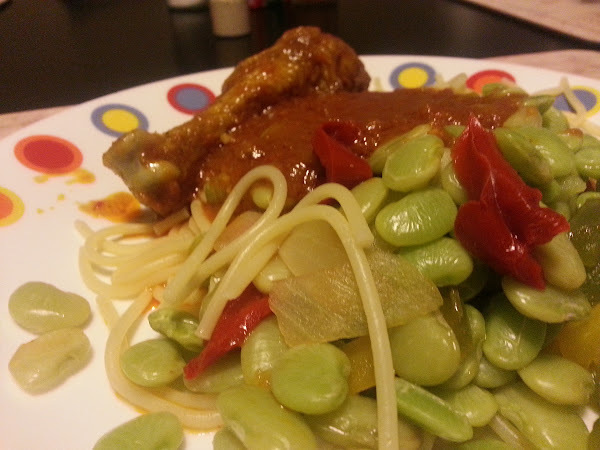 Pour the frozen green Lima beans into an oven safe dish. 2. Add a pinch of salt and cover with water. 3. Cook according to the directions on the package. Mine said to cook for 10minutes. 4. Remove from the microwave, and check that it is done. Drain. 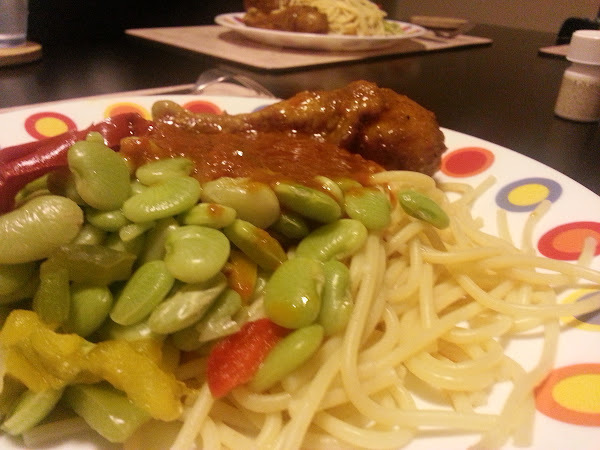 The green Lima beans turned out to be a wonderful addition to the meal. 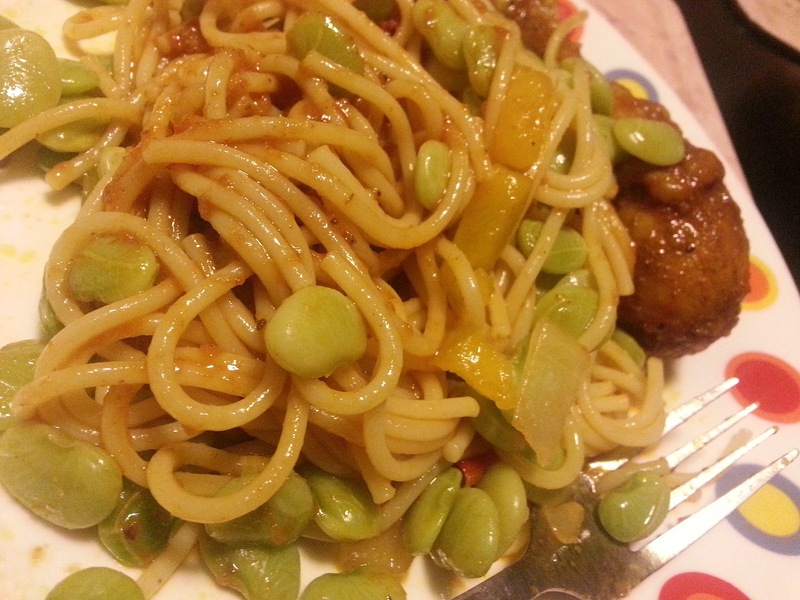 It had this soft but chewy texture that I liked, and I think it might even come into play as a main dish in our rotation. 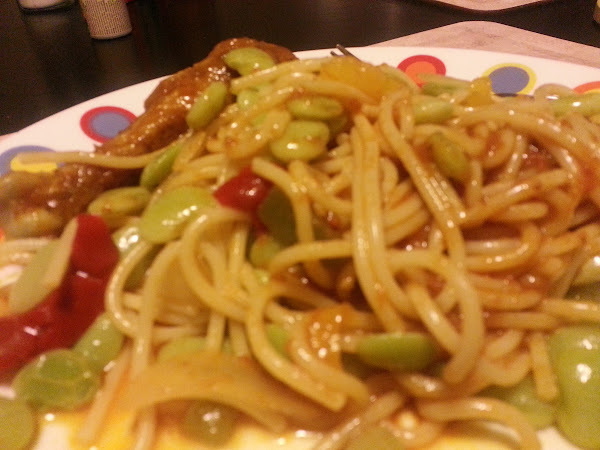 As you can see from the pictures, we added some chicken cos we love us or meat. 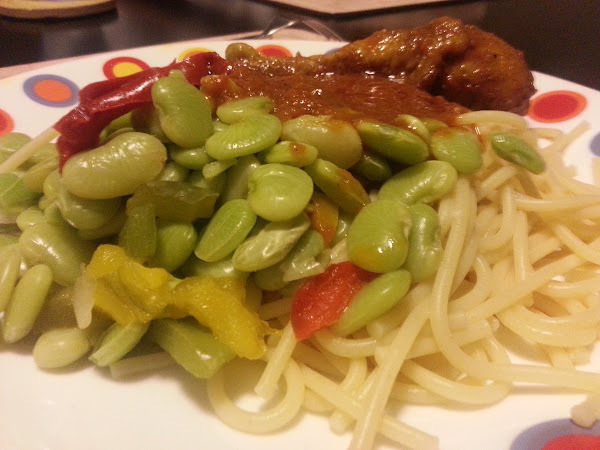 For those new to Lima beans, it's actually great more than taste-wise. Check out details here. Some other recipes I try out with new-to-me foods include celery, aubergines, and squash. Are there any other vegetables you have tried recently, or want to suggest to me?